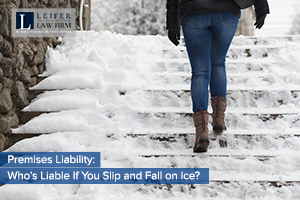 Premises Liability: Who’s Liable If You Slip and Fall on Ice? While slipping and falling on ice doesn’t always lead to a serious injury, it can. When a serious injury occurs, you may wonder if the property owner can be held responsible for your injuries and any accident related expenses. This is a situation that falls under premises liability law and there are several factors that must be understood. If you slip and fall because of ice on someone’s property that the owner or business was responsible for clearing, then they may be considered liable. The question is, how do you know for sure? The best thing you can do is to consult with a premises liability attorney who will be able to review the facts of your case, answer all your questions and explain what legal options you have. Make sure to report the fall to the property owner or business owner, even if it seems minor. If there is a hazard, they need to be made aware right away and an incident report needs to be filled out. Take pictures of the surface where you have fallen, as well as the surrounding area and the conditions present. Be sure to document the time and date of your fall, too. Get the contact information of anyone who saw you fall. Seek medical attention, even if you don’t think you were hurt badly at first. While ice is not as common in Florida as other parts of the country, it can still occur from time to time. However, if you want to prevent slip and fall accidents, regardless of if ice is present or not, make sure to use the tips here. If you are injured in any type of slip and fall accident, due to the negligence or fault of the property owner, then it is a good idea to contact a premises liability attorney. They can review the facts of your case to determine if you have the right to receive compensation. More information about premises liability cases can be found by contacting our attorneys from The Leifer Law Firm by calling 561-660-9421.